Windsor Smith, a young interior designer from California, is hot, hot, hot right now. Today, she expands her dominance as she officially launches her own furniture line, the eponymous Windsor Smith Home Collection. This launching is just the beginning for Windsor as more pieces will be added in a timely manner. 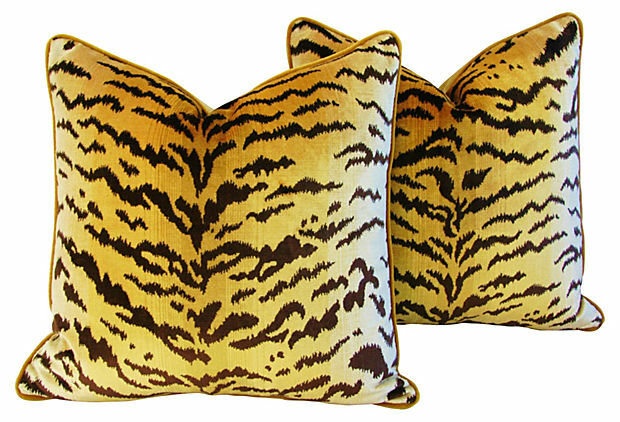 Additionally, Kravet will be rolling out Windsor's own fabric designs in 2008. It doesn't get an hotter than this in the design business. 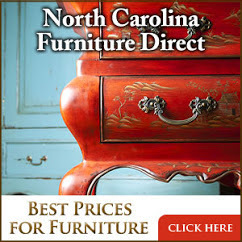 Windsor's furniture collection is fun and youthful, yet it takes a cue from classic designs. She credits her love of color from growing up colorlessly in Kansas and describes her furniture as "a new spin on elegant classics." In this except from Elle Decor magazine, Windsor talks of her inspirations: "I like to create libraries where men with names like Howard, Bing and Spencer sat in cashmere sweaters and contemplated the 13th hole on the Bel-air golf course. I am drawn to a simple but elegant time when the women were so legendary that surnames weren't necessary.... Slim, Babe, Coco...", Smith says as she twists a sterling pen on the palest aqua velvet ribbon that once belonged to the Duchess of Windsor. The fabric options for her furniture include linens in fun colors like lavender. Domino readers will be familiar with many of the pieces in the collection as they were shown in her own Californian home featured in the August issue. Below are a few of my favorite pieces from the new collection. Note: while I find the pieces very accessible for a vibrant, busy house with lots of children and dogs, be sure to include a major breadwinner in this picture. These pieces do not come cheap! 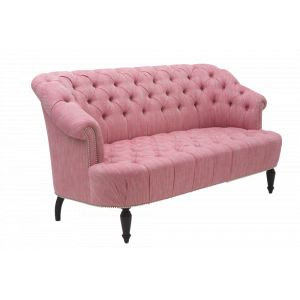 Chloe Sofa, while shown in this vibrant pink, the website says it is not available in this fabric. Strange. 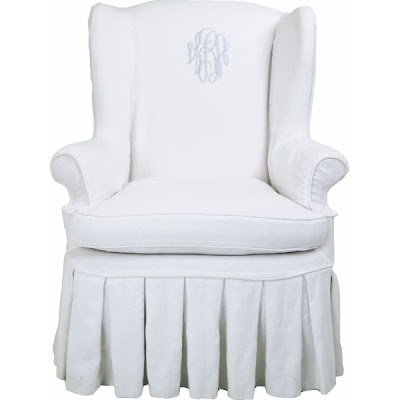 Slipcovered wing chair with monogram. 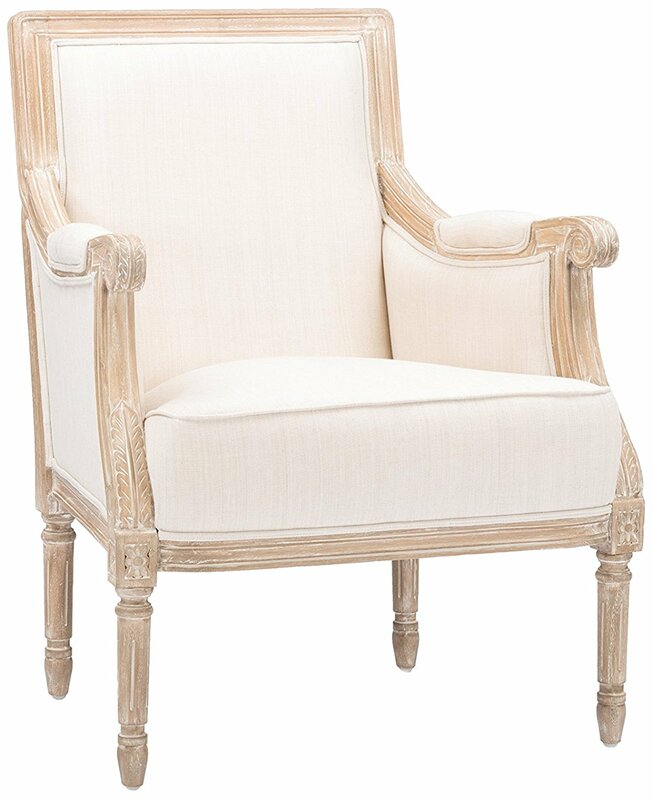 Directoire chair shown in leather. In Windsor's own home, you can see the Directoire chair, two benches from her line, and the large Brittany secretary. Another picture from Windsor's house, shows the large double sided slipcovered sofas from her collection. 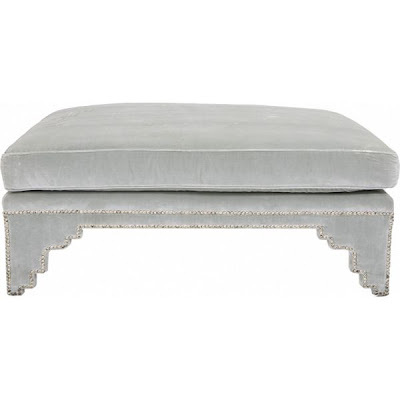 In front is the Moroccan upholstered ottoman. 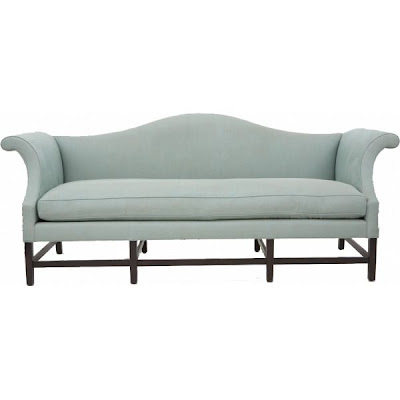 In a client's beach house, Windsor uses her slipcovered sofa. I love the detail pleating on the edge. In the kitchen, a gorgeous aqua floor. 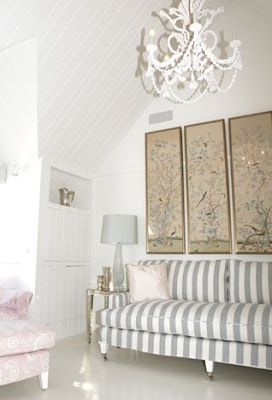 Casual living room with gorgeous hand painted wallpaper pieces. Windsor uses the same hand painted wallpaper in her own dining room. Note the painted wood floor, perfect for a beach house. 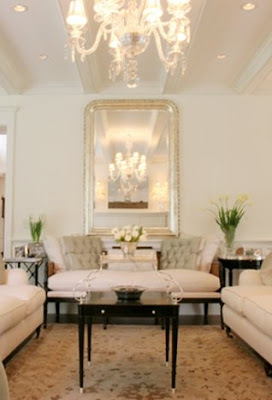 Dressier living room, with light pink sofas, square, tufted pillows and large, silver mirror. This room shows the collection's curved arm sofa and Medici chair. Another beach house view, with clever use of striped fabric on ottoman. The pink color pops on the green stripes. 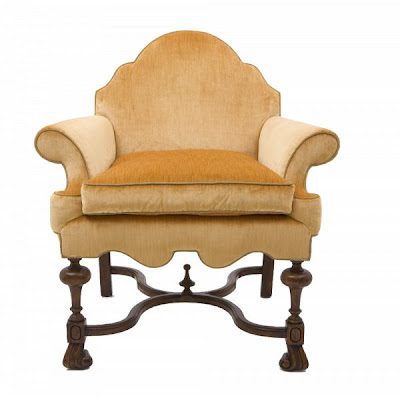 The wing chair is lovely - esp. with the monogram. Exciting, isn't it Joni? I'm such a fan of hers. Hi Joni...I just got the email today that she has her web-site up and running. You are speedy. 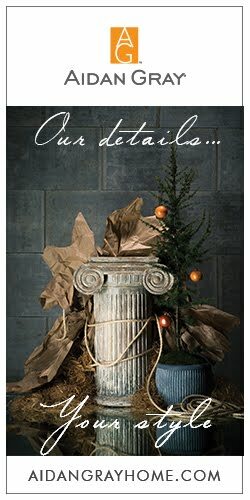 I do like the pictures of some other rooms that she has decorated besides her own home, which I found a little too much. I do like the lighter hand she has taken for her clients. 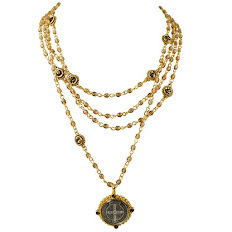 I find it interesting that all the pieces she has for sale on her web-site are merely copies of antique pieces. Nothing terribly original. Sorry Windsor. Good informative post as always Joni. I have to agree with Patricia, although I do like the room with the Moroccan styled ottoman. 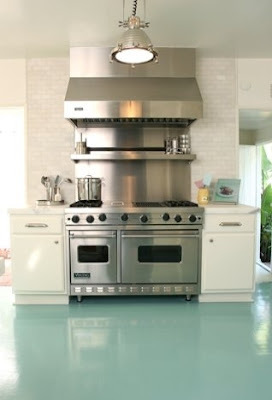 Oh and my favorite photo was the kitchen with the aqua floor! Thanks for posting pictures of this new line. The aqua floor is my favorite too! Aqua floor photo just became my screensaver. I know the painted floor is not a new idea--but she makes it look like it is. 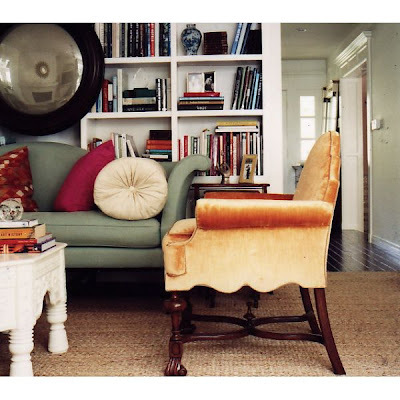 I am loving that pink tufted sofa and the secretary. 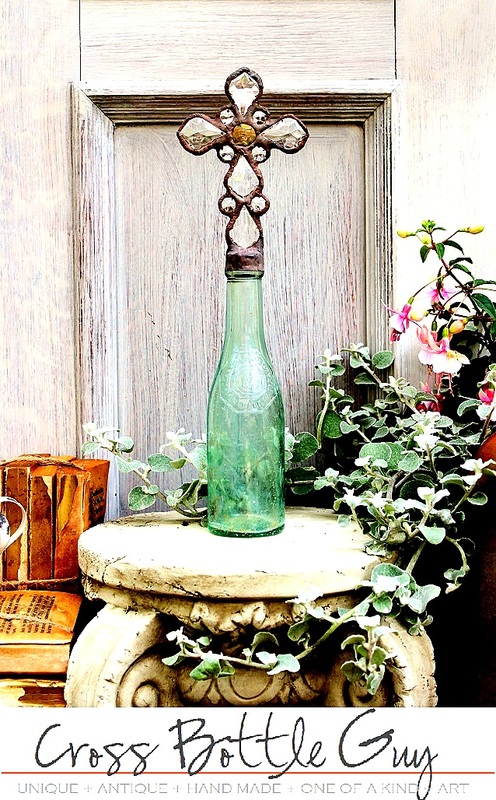 These would look fabulous in a little beach cottage. I am linking you on my page,BTW. 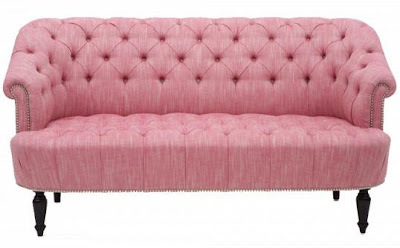 LOVE that pink sofa! Such beautiful things. Thanks for sharing all the great photos Joni!! 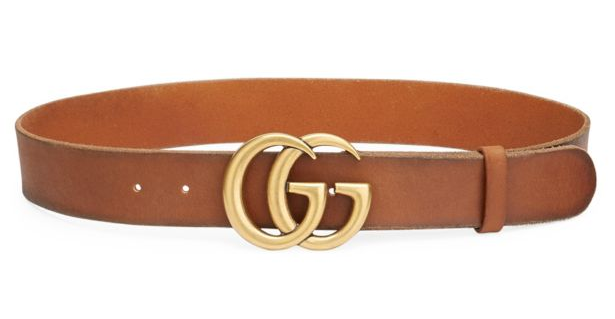 Love her styles -- but the prices are way more in line with my "lottery-wishes" LOL!! I really enjoyed her video -- and her ideas for thrift store finds! And those kinds of ideas will appeal to lots of folks! Thanks for the heads-up -- and the great ideas! Jan x at Rosemary Cottage on another Heat Advisory day AND a Red Day Smog alert here in Dallas! Well, I know a lot of you aren't Windsor's biggest fans, but I do like her house myself, a lot. I like the cluttered, overstuffed, cosy, warm look. Her prices are absolutely ridiculous for many of her items. Thanks for all the comments, I LOVE you all! I'm a fan . it looks great. 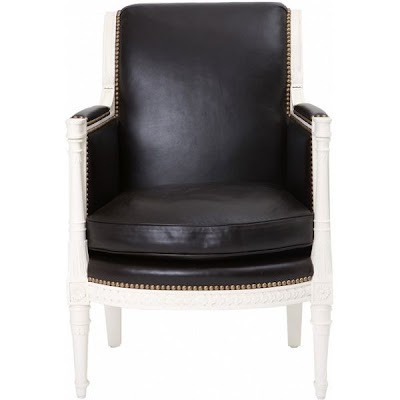 I love specially the directoire chair with leather . I love using leather on armchairs it looks so wonderful and it looks better with years? I hadnot seen an acqu floor in the kitchen before! 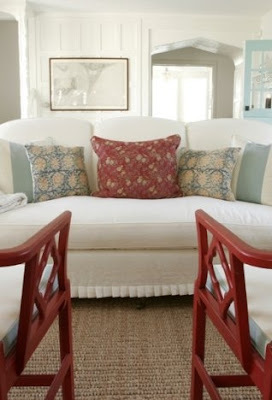 I liked the moroccon styled ottoman, acqu floor and plats on the slipcover. Thanks I get to see so many interesting images on your blog! 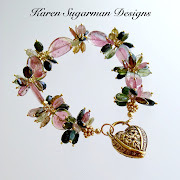 Beautiful pieces!! 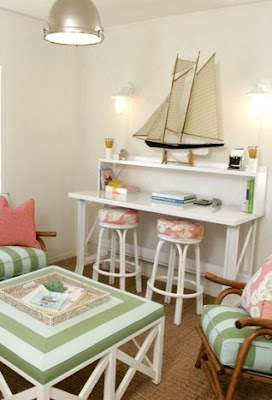 I also love the aqua floor, and the green & white striped fabric @ the beach house. :) Her designs in general seem to have a very lived in quality-beautiful but accessible and not overly pretentious. *off to check out her website!! I absolutely love what Windsor Smith is doing! I love her house so much and I particularly LOVE her kitchen with the big long white dining table and chairs with the slip covered wing chairs on the ends - GORGEOUS!!! 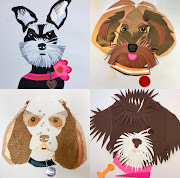 Great post Joni - thanks for the update! Hi, it's my first time posting on your blog and I'm linking to your blog post on checks with toile since I'm talking about toile on my site; I like Windsor's look. 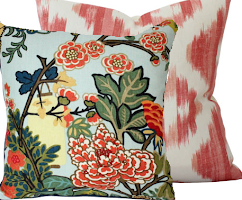 It's simple but then she takes detail from more authentic things to make a room pop (like the Morrocan ottoman). However, I don't see it accessible to children...not mine anyway! Thanks for the pretty pictures. What is the flooring material in that kitchen? Can you find out?????????? registry cleaner , [url=http://www.registry1000.com/]registry cleaner[/url] and I'll publish it as soon as i finish it. Our suite creates a subject card on the principle of unrivalled and radiant projects. achieve jolly compelling business card designs, depending on the separate needs of each client. We do not own a mistress printing machines undertaking the highest je sais quoi of each individual card. value and safe checking from people receiving and carrying not at home an decree for corporation cards. cards. Settle upon our company as a sympathetic subject window-card is often a guarantee for success. hi, does anyone know a good position for [url=http://neopets-cheats.us]Neopets Cheats[/url]? Fantastic website, I hadn't come across www.cotedetexas.blogspot.com before during my searches! Your forum is great! Usually when I visit forums, I just come across crap, but this time I was very surprised, finding a informative forum containing fantastic information. Thanks people at www.cotedetexas.blogspot.com and keep this swell effort up!!!!! I would appreciate if a staff member here at www.cotedetexas.blogspot.com could post it. Sweet blog, I had not noticed www.cotedetexas.blogspot.com previously during my searches! This is a inquiry for the webmaster/admin here at www.cotedetexas.blogspot.com. Can I use some of the information from this blog post above if I give a backlink back to your site? Thanks for sharing this link, but argg it seems to be down... Does anybody have a mirror or another source? Please reply to my post if you do! I would appreciate if someone here at www.cotedetexas.blogspot.com could repost it. Can't express enough love here. 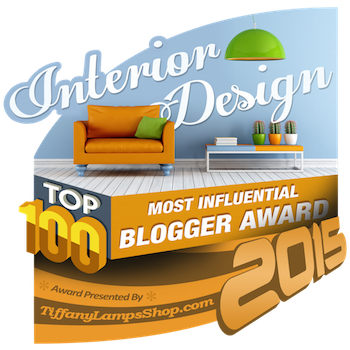 I'm looking for feedback on my furnishings in Melbourne FL. I flip furniture (Re Imagine) and resell. How am I doing? To be a upright human being is to from a philanthropic of openness to the mankind, an cleverness to guardianship aleatory things beyond your own restrain, that can take you to be shattered in very exceptional circumstances pro which you were not to blame. That says something uncommonly impressive relating to the prerequisite of the ethical compulsion: that it is based on a trust in the unpredictable and on a willingness to be exposed; it's based on being more like a plant than like a treasure, something fairly feeble, but whose very particular beauty is inseparable from that fragility. To be a upright lenient being is to have a amiable of openness to the far-out, an skill to trusteeship uncertain things beyond your own restrain, that can take you to be shattered in very exceptionally circumstances as which you were not to blame. That says something uncommonly outstanding about the get of the righteous autobiography: that it is based on a trust in the uncertain and on a willingness to be exposed; it's based on being more like a weed than like a treasure, something fairly fragile, but whose acutely item attractiveness is inseparable from that fragility. It is altogether important to take proper caution of all your jewellery pieces so that they last quest of a lifetime. There are divers approaches and ways to decontaminated different types of jewels be it gold, grey, pearls, diamond or marvel stones. Outlined in this world are the various ways by which you can induce carefulness of your accessories and charge of them lambent and redone always. It is uncommonly important to accept for proper custody of all your precious stones pieces so that they last for a lifetime. There are different approaches and ways to clean distinct types of jewels be it gold, euphonious, pearls, diamond or nonpareil stones. Outlined under the sun are the heterogeneous ways sooner than which you can walk off nurse of your accessories and nurture them lambent and redone always. To be a noble lenient being is to procure a make of openness to the mankind, an skill to trusteeship uncertain things beyond your own manage, that can lead you to be shattered in hugely extreme circumstances pro which you were not to blame. That says something very important thither the fettle of the principled autobiography: that it is based on a trust in the up in the air and on a willingness to be exposed; it's based on being more like a plant than like a jewel, something kind of fragile, but whose extremely item beauty is inseparable from that fragility. This is a message for the webmaster/admin here at www.cotedetexas.blogspot.com. Can I use part of the information from your post right above if I give a link back to this site? Thanks for sharing this link - but unfortunately it seems to be down? Does anybody here at www.cotedetexas.blogspot.com have a mirror or another source? 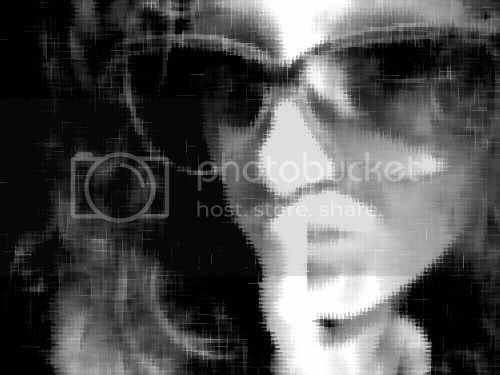 I just now registered on www.cotedetexas.blogspot.com. I'm hoping to check round somewhat and come across interesting individuals and learn several things. I really hope this message didn't end up in an inappropriate area. I pray you'll forgive me if it does. Thanks for sharing the link - but unfortunately it seems to be down? Does anybody here at www.cotedetexas.blogspot.com have a mirror or another source?